No excuses whatsoever. The data is provided, just depends how the ISPs use it. I take that they have no excuse for that? Most (large) ISPs probably don't feed the information from eCo to the systems that first line support see, or indeed any systems that the customer interacts with. I believe you just need to drop an email to Seb to request ISP status? I think that's what happened for me (though the email was sent by my Team Leader at the time). Apologies if you were already aware. Don't forget the difference between adding an agent such as yourself to Plusnet's accreditation Matthew, and getting Aquiss ISP accredited. The Router arrived today, it's a Technicolor TG582n which going by the feature list would seem to be rather basic. I guess I'll need to buy a decent router, are there any that are recommended for use with the fibre modem? Ideally it will handle 2.4 and 5Ghz simultaneously, offer hassle free wireless streaming of upto 3 HD streams ,support 2 PS3's, 2 PC's, 2 x iPads, 2 x printers and our mobiles. Well that went rather better than expected. 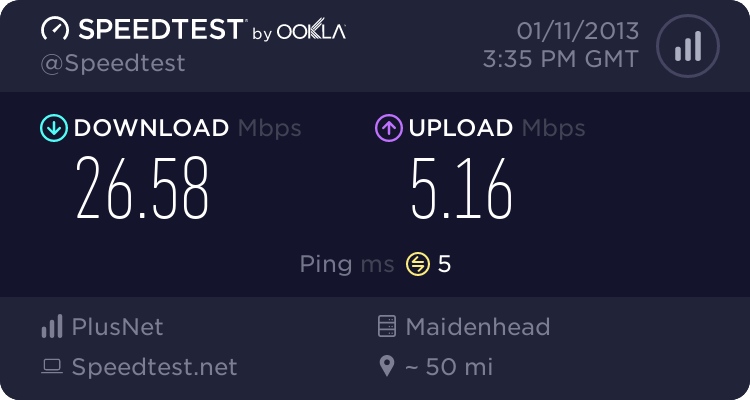 Call from Openreach guys that their going to fiddle in box, ISP and phone goes off, 15 mins later there's a knock on door, changed the BT faceplate, fitted new modem to wall, plugged in router and I'm up n running again! glad that it went well for you. what was ur speed estimate? 24 / 5 so quite close to actual. Well even the text from Plusnet suggested an Install on Friday but network up on Saturday (I had visions of contacting them on Monday etc) so was a little surprised when the guy said.. check yer PC to see if it's up!